Staff photo of Varsity Theatre, Lincoln, in 1948. NSHS RG2183.PH1948-1126 (above). 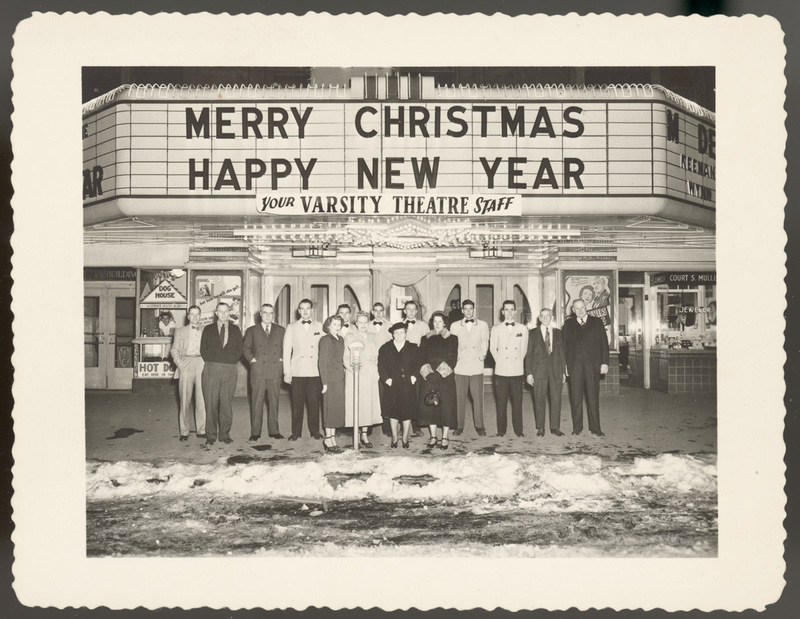 The staff of the Varsity Theatre, located in 1948 at 143 North Thirteenth Street in Lincoln, wished the movie-going public a Merry Christmas and Happy New Year in the above staff picture, published December 25, 1948, in Lincoln newspapers. An accompanying advertisement promoted a special holiday double feature at the Varsity. Both films, which ran until New Year’s, featured animal stars: Adventures of Gallant Bess, the “wonder horse of all time in the story to cheer all hearts,” and Rusty Leads the Way, in which a boy and his dog help a bitter blind girl adjust to life. A color cartoon and newsreel were also promised. To the left of the Varsity entrance in the above photo is Pete’s Dog House, a hot dog stand featured in a past blog post. Both pictures are from the Macdonald Studio Collection of Lincoln and are now in the photographic collections of the Nebraska State Historical Society.